The National Association of Professional Women (NAPW), led by lawyer and journalist Star Jones, hosted an exclusive NAPW Power Networking Event at Midtown Loft and Terrace in New York City on Wednesday, October 26th, 2016, featuring keynote speaker Jean Shafiroff. Prominent Philanthropist and Author, Jean Shafiroff, engaged the audience in a discussion of philanthropy and her debut book, Successful Philanthropy: How to Make a Life by What You Give – a guide to modern philanthropy. Attendees included: Jean Shafiroff, Star Jones, Louise Newsome, Dara Sowell, Lauren Day Roberts, Bonnie Pfeiffer Evans, Dawne Marie Grannum, Katlean de Monchy, Flo Anthony and Shana Schlossberg. 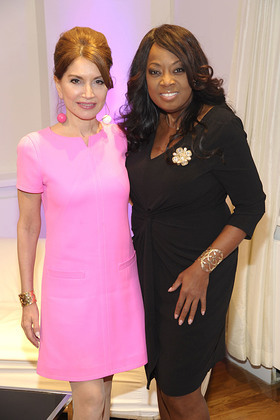 The exclusive 2-hour philanthropy themed networking event, inspired by “The Power of One” panel, was hosted by Star Jones, and is part of an interview series featuring professional women who power their passions into meaningful success. An exclusive Q&A took place with Philanthropist, Author and Socialite Jean Shafiroff who told the audience what inspired her to get involved with charities and how those interested in volunteering can use the tools described in Shafiroff’s book to ensure they donate their time to a good charity that they can connect with. Shafiroff’s heartfelt speech inspired discussions among event participants, who were also given the chance to purchase a signed copy of Shafiroff’s book. Successful Philanthropy: How to Make a Life by What You Give was written by Jean Shafiroff and published by Hatherleigh Press, Ltd. in 2016, and serves as a practical guide for both the aspiring and seasoned philanthropist. It features an introduction from Georgina Bloomberg, the daughter of former New York City Mayor Michael Bloomberg, and includes a foreword by Scott Elkins, US Campaign Director of the Margaret Thatcher Scholarship Trust at Oxford University and CEO of SE Advisors, who salutes author Jean Shafiroff for encouraging others to “help bring about change,” through the text and her philanthropic initiatives in any way possible. A volunteer fundraiser, leader and spokesperson for several charitable causes, the spectrum of Shafiroff’s philanthropic work includes improving the lives of underserved populations, women’s rights and well-being, health care, animal welfare and resources for children in need, in addition to other causes. Jean serves on the boards of New York City Mission Society, New York Women’s Foundation, French Heritage Society, Couture Council (Museum of the Fashion Institute of Technology), Jewish Board of Family and Children’s Services (20+ years), Southampton Animal Shelter Honorary Board, and Southampton Bath & Tennis Club’s Charitable Foundation. Each year she chairs numerous galas and hosts events benefiting numerous not-for-profit organizations. The NAPW Power Networking Event offered attendees the unique opportunity to learn from Shafiroff herself how they can incorporate charitable work into their everyday lives.